Allan and the Holy Flower, also known as The Holy Flower, is an Allan Quatermain adventure featuring a gigantic orchid guarded by an ape and tended by an abducted English missionary’s wife. It is the first novel in a series of Quatermain's adventures with his companion Hans, followed by The Ivory Child (1916) and The Ancient Allan (1919). The Windsor Magazine serialized The Holy Flower from December 1913 to November 1914, in an edition illustrated by Maurice Greiffenhagen. 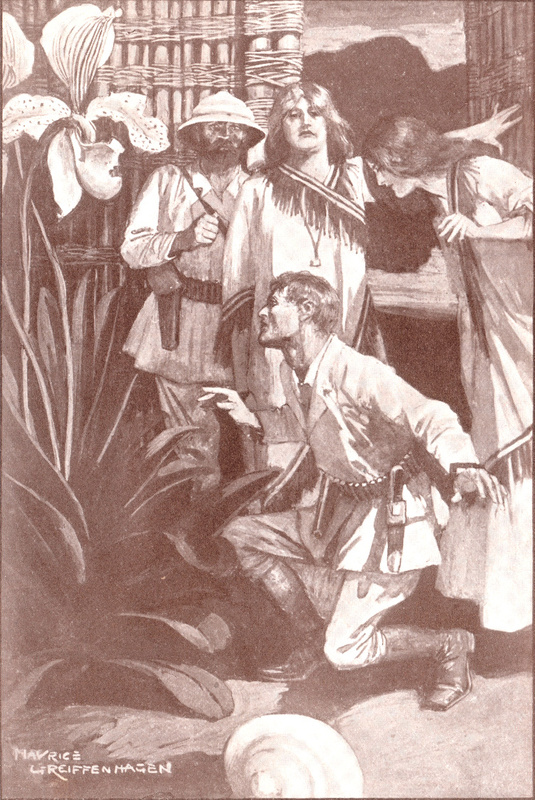 Longmans, Green, and Co., New York, published the first US edition in 1915 as Allan & the Holy Flower, which included twelve full-page illustrations by Greiffenhagen. Ward Lock, London, published HF in 1915. The Ward Lock edition includes 16 Greiffenhagen illustrations, 4 more than Longmans. 14,000 copies were printed. Whatmore records that Thomas Nelson & Sons published an edition in 1915, in their Nelson's Continental Library series (No 2. in the series). Macdonald & Co., London, published an edition of AHF illustrated by Hookway Cowles in 1954, 1st thus, with a 2nd imprint appearing in November 1963. Pocock, Tom. Rider Haggard and the Lost Empire. London: Weidenfeld and Nicolson, 1993. 165, 187. Whatmore, D.E.. H Rider Haggard: A Bibliography. Westport, CT: Meckler Publishing Co., 1987. F42, 58-59. 1st US edition. New York: Longmans, Green and Co., 1915. The Holy Flower; 1st UK edition. London: Ward, Lock & Co., 1915. Macdonald Illustrated Edition, 2nd imprint. London: Macdonald & Co, 1963. The Windsor Magazine, vol. 39. London: Ward, Lock & Co., April 1914. The Windsor Magazine, vol. 40. London: Ward, Lock & Co., August 1914. The Windsor Magazine, vol. 39. London: Ward, Lock & Co., December 1913. The Windsor Magazine, vol. 39. London: Ward, Lock & Co., February 1914. New Story Magazine, vol. 7, no. 3. Chicago: Street & Smith , January 1914. The Windsor Magazine, vol. 39. London: Ward, Lock & Co., January 1914. The Windsor Magazine, vol. 40. London: Ward, Lock & Co., July 1914. The Windsor Magazine, vol. 40. London: Ward, Lock & Co., June 1914. The Windsor Magazine, vol. 39. London: Ward, Lock & Co., March 1914. The Windsor Magazine, vol. 39. London: Ward, Lock & Co., May 1914. The Windsor Magazine, vol. 40. London: Ward, Lock & Co., November 1914. The Windsor Magazine, vol. 40. London: Ward, Lock & Co., October 1914. The Windsor Magazine, vol. 40. London: Ward, Lock & Co., September 1914.